100 steps to beachblock to plazaIdeal location.Penthouse 1000 sq ftcovers whole top of building.Private entrance below.Lg living room w/AC, extra beds, views, TV, lounging area, dining table, open floor plan to kitchen, doors to 2 terraces.Bedroom w/AC good queen bed, extra sleeping for small child, views, doors to terraces.Kitchen w/full size appliances, open floor plan, door to terrace.Bathroom w/lg custom shower and jaccuzi tub.Two terraces w/sweeping views, hammock, lounge chairs, dining tables, palapas with fans and lights.We supply beach towels, chairs, umbrella, cooler bag, boogey boards.WiFi, AC, TV, DVD, CD, safe. purified water, beach shower, grill in tropical garden golf cart charging station, parking in front or on side.Sleeps 4 + toddler.Above world while steps to beach and life of the village w/restaurants, stands, shopping, tour opps, surf lessons, boat trips, etc.housekeeping and good manager. Spacious w/1000 sq ft w/terraces. Large Villa and Penthouse - Rent one or both. Well designed w/vibrant traditional colors and murals. Feels like home with a vacation flare. Comfortable. 2 bedrooms w/king beds, good mattresses and linens, AC, fans, screens, doors to back balconies. Living room double size with bed, lounging area, TV, area with table for dining or computers, glass french doors to balcony, open floor plan to kitchen. Kitchen w/full-size appliances, fully equipped, counter space, dinng table, bar, open floor plan to living room. Tiled bathroom Bathroom fully tiledw/large custom shower. Front balcony - guests enjoy it to unwind with friends, read, nap or watch the world go by below. Beach towels, chairs, umbrella, cooler bag, boogey boards. WiFi, AC, TV, safe, purified water, beach shower, grill, golf cart charger, parking in front or on side. Housekeeping, good manager, information for transportation from airport and for your stay. Support to find a cook, child care or cribs, tours, surfing informaiton, yoga, boat trips, Spanish lessons. Board storage on balconies or on side of house in locked passageway. Comfortable, high ceilings, curved archways, hand crafted tiles and wood w/glass french doors/windows in front and double pane windows and sliding screens in bedrooms. Living room has space for separate activities for various members of your family or group, including dining indoors or out, working on laptop, doing puzzles, playing games, watching TV or DVDs, listening to music. Often a guest is on balcony, another at table, a child watching a DVD or taking a nap, someone cooking in kitchen, someone on laptop at the bar. Ideal for small families, groups of friends, couples, small artist and writer retreats, and even for singles. Sleeping accommodation is 5, possibly expanded with infant or toddler(s). We have two king beds, one in each bedroom, and one good single bed in living room. Villa is an experience you'll relish. Extremely comfortable. 100 steps to beach, block to plaza, ideal location, sweeping views. 1000 sq ft Penthouse covers top floor w/terraces and private entrance below. Bedroom large w/queen bed and lounge chair w/matress, AC, fans, double pane windows and screens, entrances to both terraces. Living room dbl size with single bed + dbl wide lounge chair designed for sleeping, AC, TV, lounging area, dining table in front of view window, open floor plan to kitchen, doors to both terraces. 2 large terraces w/sweeping views, hammock, lounge chairs, dining tables, palapas w/fans and lights. Guests love relaxing on terraces for hours, day and night, dining, socializing, reading, daydreaming, napping. . Fully equipped tile kitchen with large appliances. Tile bathroom w/large custom shower and jaccuzi tub. AC, WiFi, Cable TV, CD, DVD, safe, purified water, beach shower, grill, surf board storage on balcony or beside house, golf cart charging station, parking in front or on side. Beach towels, chairs, cooler bag, umbrella, boogey boards. Assistance with finding transportation from airport, a cook, child care and touring. Welcome email to help prepare and information binder for assistance while there. Ideal space for honeymoons, anniversaries, couples with friend or child, friends, artists and writers, and comfortable for singles. 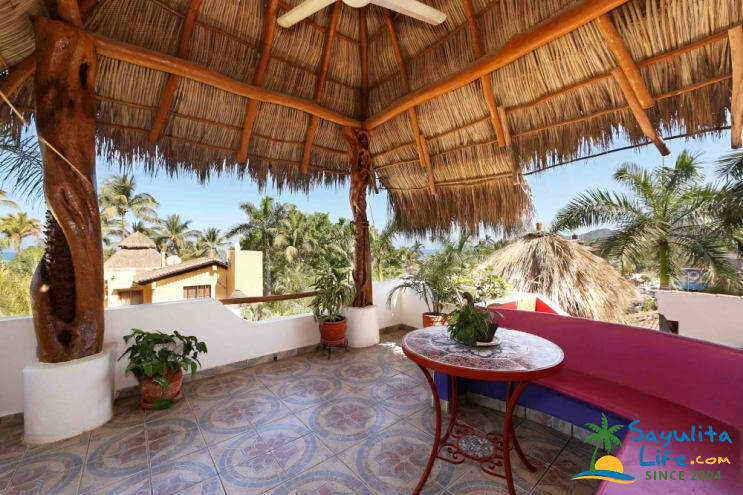 Penthouse is home with a vacation flare, well designed with vibrant traditional Mexican colors and decor. Comfortable wide rooms with high ceilings, views, airy w/lots of space. Bedroom and living room on opposite sides of house. Above the world, but steps from everything in the village and the beach. A place to unwind and relax. Great stay, great home, great location! One of the best houses ever. Great location, the kitchen was fully stocked with everything the back patio had a great laundry line for hanging clothes at the end of the day. We will stay again!! My wife and I stayed in the spacious, top-floor penthouse suite for part of last week, and we have no complaints at all. This place is very clean and well-appointed, and I can say that as a former ex-pat who has lived in Mexico in the past. So many hotel rooms and rental properties fall short when it comes to the little things, such as extra supplies, lighting, and places to store and simply just PUT stuff such as clothing or shopping purchases. No so, with the Sueños penthouse. The suite provides ample room to stretch out, unpack, and relax, with far more towels, extra toilet paper, bottled water, etc. than we could ever use during ur 4-night stay. A full kitchen, funky and colorful decor, two separated balconies, A/C units and ceiling fans that work well, a huge bathroom with a shower and separate bath rub, etc. Tony was very responsive to our needs when we couldn't find a certain key, and Cece was quick on email and a pleasure to communicate with throughout the reservation ad trip-planning process. Fantastic location, too. There was loud live music playing in or near the plaza every night that we could definitely hear from the back deck, but the hum of the bedroom fan and A/C unit completely drowned out the noise. We slept like babies. Highly recommended for a couple or a couple +1 guest or child. Casa Suenos del Mar in Sayulita was wonderful. The manager was there when we arrived and gave us a quick and helpful tour and info on everything we needed to know. The location is absolutely perfect if you want to be close to the beach and town!! It was wonderful to be so close to the square, we could get around town so easily!! It is also perfectly quiet at night which is a wonderful combination. The house was spacious, clean, and had everything we could want - ceiling fans, kitchen supplies, an open air deck. I would definitely stay here again. Casa Suenos del Mar was perfect for our Sayulita vacation. The location was amazing, with great amenities. The manager and housekeeper did a great job. One of the guests had the flu and the manager took note and stopped by just to check in which was so very kind. The downstairs tenant was also extremely helpful and kind. The only small downside was that the WiFi was intermittent. The owner looked into the situation right away and it was due to some street construction. We would return in a heart beat. Casa Suenos Del Mar was the perfect place for our group of 4 to spend a 3 week vacation. From my first enquiry to our last day we received great information and attention. The 2 bedroom 2nd floor suite was a great size, spotlessly clean and with plenty of homey yet authentic touches. The manager was easily reached (even though we didn't need her assistance- she still emailed and came by to check on how things were going) and the cleaning lady was superb. The location was great being only a very short walk to the beach and stores. We had a wonderful time and would visit again. My husband and I enjoyed our stay at Casa Suenos del Mar in Sayulita. The location was so close to both the beach and town. The penthouse was comfortable and very well decorated, with an extremely helpful property manager. We would love to return to Sayulita and to Casa Suenos del Mar again! Casa Suenos del Mar was a perfect retreat for 5 nights in Sayulita for a friend's beach wedding. It suited the two of us perfectly. It was spacious with a large kitchen, A/C and ample fans to keep cool when we were inside, with a beautiful veranda for relaxing outside. All this and only steps to the beach. We planned to eat a few meals out and cook a few in - and we did just that. It was wonderful. Cecile provided all the needed beach amenities as well, and then some.. beach towels, chairs, boogie boards, a cold pack to bring provisions to the beach. I would love to return next time in Sayulita and perhaps even bring a couple friends. Casa Suenos del Mar was exactly as described: one block from the beach and one block from the restaurants and shops (Sayulita is such a fun little town!). There were plenty of towels provided, beach chairs, boogie boards, umbrellas, etc. which we really appreciated. The casa is very clean and in very good condition with a fully stocked kitchen. A/C and fans were another major plus! Maria was extremely responsive to any needs; anytime I emailed her in a matter of minutes she had either responded or solved the issue. Would definitely come back and stay here- very pleased! Casa Suenos del mar in Sayulita was the best. It was such a pleasure to stay at this house. Everything is more than expected, the house, the location and service. We are looking forward to visiting Sayulita again. Casa Suenos del Mar in Sayulita exceeded our expectations! Such a wonderful experience! Everything was clean, the kitchen was well prepared and stocked with everything you need. The best part is the location, which is steps from the beach. The house was gorgeous with unique Mexican style which we loved. Cecile is one of the sweetest hosts ever. We wouldn't hesitate to stay there again. Recommend 100%! Summer - Month-long booking specials. Bank and credit cards accepted. 1/2 to book; 1/2 30 days before arrival. Reservation is final only when deposit received. One night stay additional cleaning fee. Villa 5 limit; Penthouse 3 pers limit. Add'l pers over 10 yrs $15/nt (under 10 yrs, no extra chg). Came to Sayulita in 1996 and fell in love with it. We were able to create this home to share our experience of this magical town with you. One of us is American, one Mexican, so we contributed an international aesthetic. We strive to provide good management and services.